The best way to shop? With the seasons. So, every 2 weeks at Kitchen Stories, we’ll be highlighting a different in-season ingredient along with 3 new recipes. To the market, we go! After years of being left behind on shelves in the supermarket, the dark red superfood is finally celebrating its comeback! The pickled slices in the back of grandmas’ cupboards have been replaced with with even trendier preparations like chips, smoothies, or hummus, making the red root seem all shiny and new. Here, you’ll find out everything else you need to know about beetroot, plus three new recipes just for you! What’s your favorite recipe with beetroot? Tell us in the comments, then upload a picture of your creations for all to enjoy! 1.Hello, My Name is Beetroot! Beetroot is a special type of root vegetable, originally steming from the Mediterranean. Its intense red color and earthy taste make it unique and the center of divergent opinions. Other than the popular red variety, there is also a bright yellow and a pink striped version, which is slightly sweeter in taste, but not too different from its red sibling. The root is a real power house and provides its consumer with folic acid, iron, and zinc as well as vitamin B and C. These nutrients then improve the immune system and therefore help you fight viruses and unwanted bacteria. And just in case you didn’t know: Beetroot leaves contain six times as much vitamin C as the root itself! Since beets are a winter vegetable, it’s in season from September until March. Then you can find it freshly harvested loose or in a bunch at your local farmers market and in many supermarkets. All year round however, you can find beetroot peeled, cooked, and vacuum-sealed in stores. If the stems and leaves are still attached, it is a sign that they are fresh and good quality. 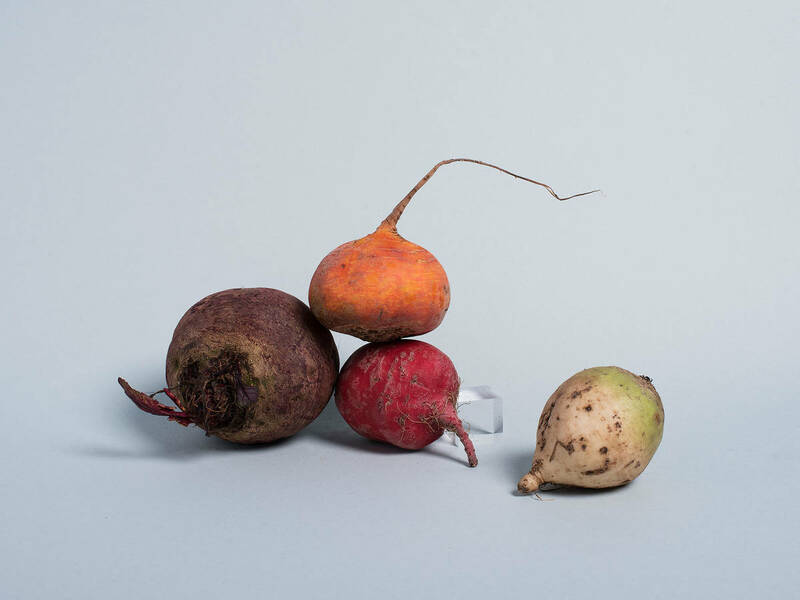 Large and thick beets have a tendency to be fibrous and taste woody, which is why we recommend buying the smaller ones, which are especially tender and more aromatic. The beetroot is not fresh anymore if you can press your finger into it. The peel should be intact and smooth. If they are ripped or shriveled, it is best to keep your hands off them. Beets are best kept in a dark, dry, and cool place. Wrapped in a kitchen towel, they can stay fresh in your fridge for up to 10 days. Alternatively, you can also wrap them in aluminum foil and poke it with holes to keep them fresh for longer, and even preserve nutrients. After cooking your beets, you can even freeze them without loosing any of their freshness or crunchiness. Beets have a tendency to stain, which is why you should always wear gloves and an apron when working with them. We even recommend covering your cutting board in paper towels or wax paper to save it from stains. And if you are left with stains regardless of the precautions, lemon juice or ox gall soap should do the trick. Since the most important nutrients are lost during cooking, it is important to gently wash the beets before cooking to keep the peel in tact for preserving the nutrients inside; therefore, only peel the beets after cooking. To avoid bleeding out, it is best to twist off the ends instead of cutting them. Beetroot is a real all-rounder when it comes to the possibilities of how to prepare it. You can eat it raw and thinly sliced in a Carpaccio (link to our recipe), as a base for creamy soups, in hummus and other dips, or as chips. Whether they are cooked, boiled, roasted, or puréed, they will always leave an impression.